In 2008 Sudan, Nya's primary responsibility is to fetch water. Twice a day, she walks for miles to the watering hole where she collects water for her family. She carries the heavy container home, only to return for a second time so they have enough water to survive. In 1985 Sudan, Salva is at school when he is forced to flee the war and is separated from his family. He embarks on a journey that will take him to Ethiopia, Kenya and eventually the United States. 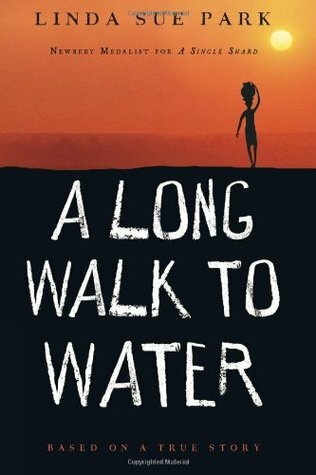 A Long Walk to Water by Linda Sue Park is a middle-grade novel based on a true story of one of the "Lost Boys of Sudan." Salva was one of thousands of young men in a Kenyan refugee camp chosen to go to America and be adopted into a family there. But before he made it to America, Salva spent years walking to safety. At first, he walks across Sudan to Ethiopia with a group of people that he fears will leave him behind since he is so young. Later, he leads a group of boys to Kenya where many find salvation. Salva's story is alternated with that of Nya, who lives in more modern-day Sudan. Nya's story is focused around the struggle of finding clean water. She walks for hours every day to fetch water, but it is not clean. Her family has to drink this dirty water or they will die. But the water is dangerous itself and can make them sick. This is a serious issue in many areas of the world, and an excellent lesson for middle grade readers. In the end, these two seemingly unrelated stories are brought together in a wonderful way. This was one of my 9-year-old son's favorite parts of the book. He said, "I liked that it went back and forth between the two characters and at the end that it all tied together." He really liked the book overall. He told me he didn't realize people had to walk so far for water. He hadn't heard of the "Lost Boys of Sudan" either. I highly recommend A Long Walk to Water for older elementary and middle schoolers. It's an educational story but it keeps the reader's interest throughout. There are scenes of war and loss, but the story ends up being quite uplifting. This review was written based on a copy of A Long Walk to Water that I purchased.